Black violet color. Fruity aromas of fruit punch and black tea with a slightly chewy, vibrant, fruity medium body and an effortless, interesting, medium-length holiday spice drop candies, balsamic drizzled plum, black pepper, and potted geranium finish with grippy tannins and moderate oak flavor. An interesting and very fruity malbec that delivers heaps of spice on the palate. 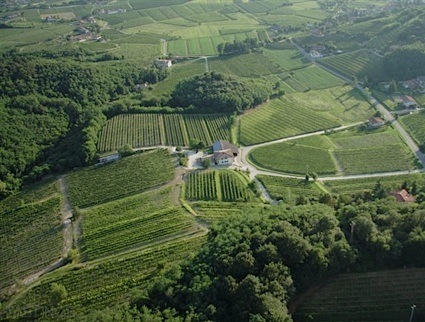 Bottom Line: An interesting and very fruity malbec that delivers heaps of spice on the palate. 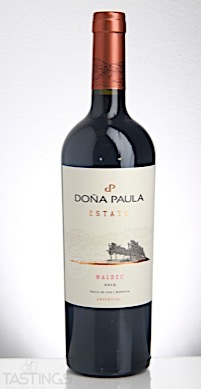 Doña Paula 2015 Estate, Malbec, Uco Valley rating was calculated by tastings.com to be 87 points out of 100 on 9/18/2017. Please note that MSRP may have changed since the date of our review.